Last year, Rolls-Royce Motor Cars announced the development of an all-new aluminium space-frame architecture that will underpin all future Rolls-Royce models arriving in market from early 2018. The company today announced that it has begun the testing phase of this new architecture, with early preparatory activity seeing new engineering mules tested in public around the world. Engineering mules will be assessed on public roads in various locations around the world. The current testing phase aims to ensure that the new space-frame structure perfectly delivers Rolls-Royce’s trademark ‘magic-carpet ride’ on a variety of surfaces and that it is resilient to extreme weather conditions. 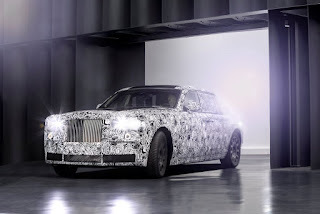 The assessment of the new proprietary architecture is the first stage of a development program that will see a new generation of Rolls-Royce motor cars become available from early 2018.